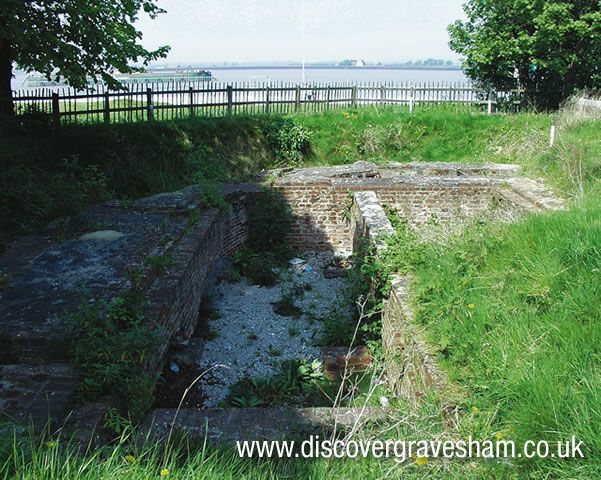 Set within a lawn on the riverside of the former Clarendon Royal Hotel at Gravesend is the foundations of the Gravesend Blockhouse. 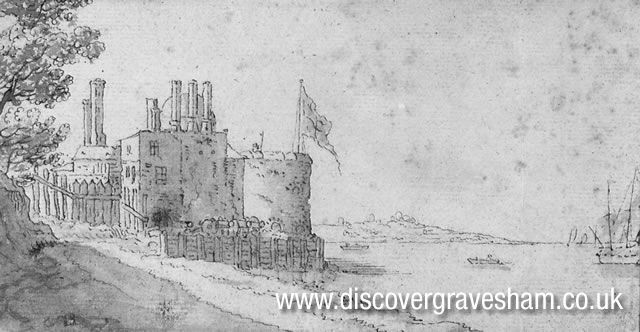 For over 300 years until demolition in 1844, this building was a prominent feature of Gravesend’s river frontage and a familiar sight to incoming and outgoing seafarers. Throughout this period, the blockhouse was mentioned in the accounts of visitors to the town, in guidebooks and histories and was portrayed in numerous contemporary maps, views and panoramas. The foundations of the blockhouse are important in offering the visitor the only visible remains of the first system of artillery defence established for the River Thames by Henry V111 in 1539/40. It is a scheduled ancient monument. The remains of the blockhouse are a reminder in brick and stone, of an age in which England and the states of Continental Europe settled their disagreements with each other by force of arms. The risk of raiding or invasion during a period of war led to a need to provide ports, coasts and strategic rivers with land based defences, as a second line behind the Navy. Foremost among the rivers was the Thames. The Thames was the most important river in the Kingdom. As the maritime route to the capital in which the political and economic life of the country was centred, its security involved vital national interests. Indeed, by the reign of Henry V111, around 80% of English exports passed out of the river. As well as this, there were the important royal dockyards at Deptford and Woolwich to defend. The arsenal at Woolwich became the central store for England. The banks of the narrowing stretch of water known as Gravesend Reach were important for the siting of defences to oppose the way upstream to an enemy fleet and to prevent a landing. The Thameside Archaeological Group excavated the remains of the blockhouse in 1975/6. A more detailed history of the Blockhouse can be found in ‘The Gravesend Blockhouse’ by Victor Smith. See publications page.